Former New England Patriot Aaron Hernandez pleaded not guilty to all charges including first-degree murder following his indictment in the killing of a friend authorities said was shot five times in an industrial park in Massachusetts. The Bristol, Conn., native showed no emotion as he pleaded not guilty to murder and weapons charges in Fall River Superior Court. Hernandez has been held without bail since he was arrested and there was an agreement that there would be no discussion on bail today. He will continue to be held without bail, without prejudice. 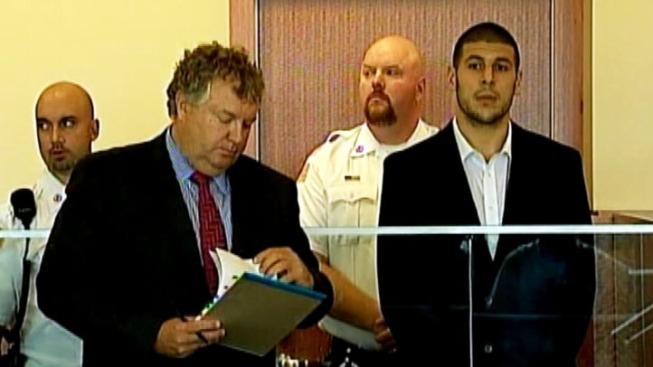 Another court date has been set for October 9 at 2 p.m.
A Massachusetts grand jury last month returned the indictment against Hernandez in the death of Odin Lloyd, a 27-year-old semi-professional football player from Boston who was dating the sister of Hernandez's girlfriend. It also includes five gun counts. Hernandez, 23, was arrested in June and pleaded not guilty to murder and weapons charges in district court. The indictment moved the case to superior court, where jury trials in murder cases are held. The ex-athlete was cut from the Patriots within hours of his arrest. Prosecutors said Hernandez orchestrated Lloyd's killing because he was upset at Lloyd for talking to some people with whom Hernandez had problems at a nightclub a few days earlier. Defense attorneys said the evidence is circumstantial and that the state's case won't hold up. Hernandez's loved ones were in court for the arraignment, as was the Lloyd family. During the arraignment, the judge also addressed a motion to preserve evidence and asked if there was any objection. The state objected and said the motion required the state to preserve evidence that is beyond its jurisdiction and potentially beyond its capability. Prosecutors said they received the request by e-mail at 12:15 p.m. and asked to discuss the matter at a later time, but the judge instructed the state to notify other agencies, both in and out of state, of the request so they preserve evidence. Two other men who prosecutors said were with Hernandez when Lloyd was killed are also facing charges. Ernest Wallace was indicted on a charge of accessory to murder after the fact. He earlier pleaded not guilty to the same charge in district court and was ordered held on $500,000 bail. Carlos Ortiz pleaded not guilty to a firearms charge and is being held without bail. He has not been indicted. Lloyd's body was found by a jogger on June 17 in an industrial park in North Attleboro, about a mile from Hernandez's home not far from Gillette Stadium, home of the Patriots. Authorities said Lloyd was killed with a .45-caliber Glock, which hasn't been recovered. But prosecutors said they have video footage of Hernandez at his home, holding what appears to be a Glock, in the hours before and just after the killing. Prosecutors have not identified the triggerman, but according to court documents, Ortiz told police Wallace said it was Hernandez. Hernandez's cousin, Tanya Singleton, also was indicted on a criminal contempt charge after prosecutors say she refused to testify before the grand jury hearing evidence in the case, even after they offered her immunity. Her attorney has agreed she be held without bail. Hernandez is also suspected of being connected to the investigation of a 2012 double homicide near a Boston nightclub. While probing Lloyd's death, police found an SUV, sought in the earlier killing, at the home of Hernandez's uncle in Bristol, Conn. It had been rented in Hernandez's name.